Place the 2 ball on the rail about 1/2 inch from the left side of the pocket. 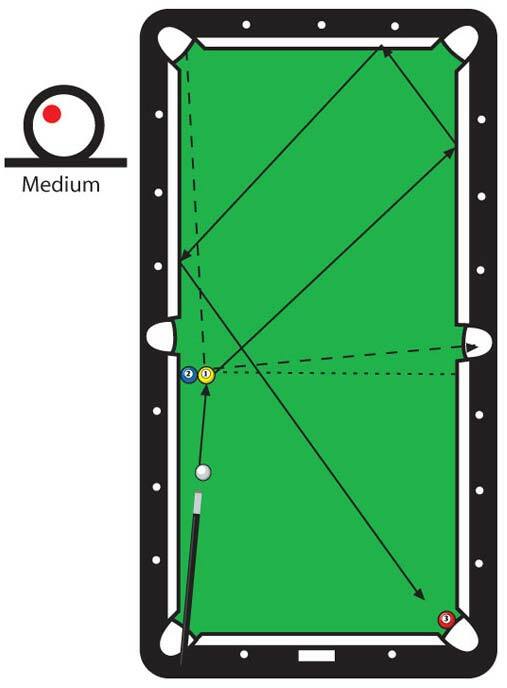 Freeze the 1 ball to the 2 ball with the axis between the two aimed straight across the table. Put the 3 ball in the lips of the right corner pocket. Position the cue ball near the rail between diamonds 5 and 6. To pocket all three balls in rotation in one shot, aim the one ball at daimond no.2. Hit the cue ball with a top left follow through stroke. The 1 ball crosses the 2 ball throwing the 2 into the opposite side pocket. The weight of the cue ball throws the almost dead 1 ball into the left corner pocket. Running english carries the cue ball three rails to the pocket the 3 ball.